← ‘Cut and Come Again’ Soup !! These Middle Eastern falafel balls are such a versatile food that you will usually find a large bag of them in my freezer. The beauty of them is that the recipe can be slightly adjusted each time using different herbs or adding some toasted sesame seeds to make a pleasant change. It’s important to use dried chickpeas (soaked) in this recipe as the tinned ones make the mix too wet, although a spoonful or two of buckwheat flour or similar should make them hold together. Falafel balls are known as ‘street’ food and can be served in pita bread with a salsa; as an appetizer or on their own and we love serving them with a delicious dip made with a squirt of honey, a spoonful of lemon juice, a large handful of parsley and dill – all blitzed together with some homemade live yoghurt. 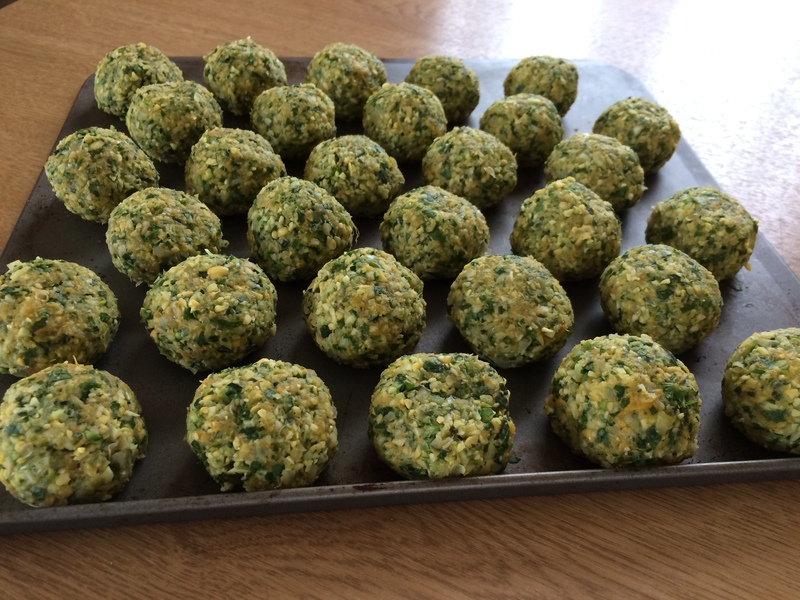 Originally deep fried, these oven-baked falafel balls are much more healthy and nutritious. Soak the dried chickpeas for 24 hours, rinse and drain well. Peel the sweet potato and cut into small pieces. Boil until tender then drain and mash. Alternatively, bake the potato whole in the oven for about 1 hour and scoop out the flesh. Trim the ends of the courgette, peel and chop the onion and garlic cloves. 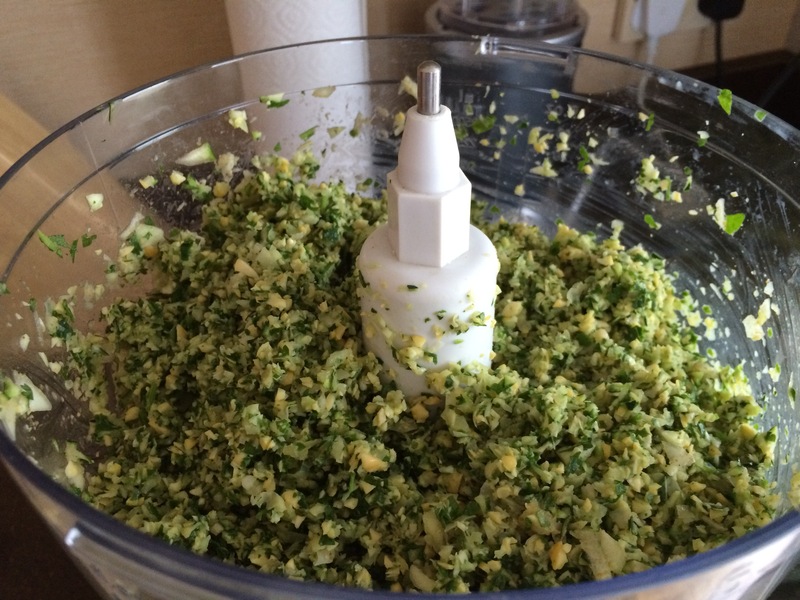 Place all ingredients, except the oil, into a food processor and blitz for a few seconds until chopped. Don’t blend for too long as a course mixture is preferable. Using your hands, shape into small balls, slightly smaller than a golf ball; place on a parchment lined baking sheet, flatten slightly and then open freeze until solid. This recipe makes about 35 to 40 small balls. Store in either a clip-top box or a freezer bag until required. These falafel balls are best baked from frozen. Brush with oil and cook for approximately 30 minutes in a 200°C oven, turning half-way through cooking. Serve with a yoghurt dip, in a pita bread or as part of a main course. However you serve them, they are delicious. This entry was posted in Brunch, Dinner, Lunch, Miscellany, Vegetarian and tagged Chick Peas, Coriander, Courgettes, Falafel, Gluten Free, Healthy Eating, Mint, Parsley, Probiotic Yoghurt, Sweet Potato, Vegetarian. Bookmark the permalink.